Dishonesty is just plain wrong, I know because my mama told me so. But there are grey areas, and here’s one of the haziest of them all, because it makes you look at history with sceptical eyes. So I’m strolling though the British Museum’s Prehistory and Europe section past some of the great finds of all time. 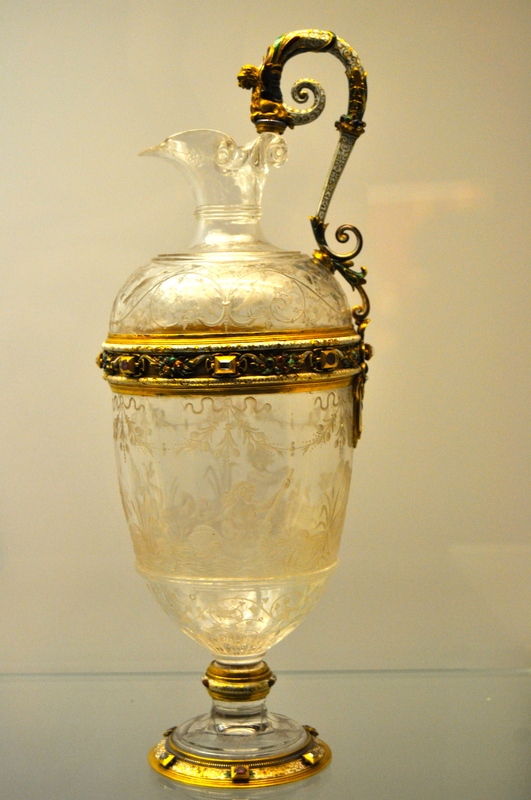 The British Museum tells me it is from London, and 1554-5, it is a silver-gilt ewer, an early example of the English Mannerist style: sophisticated, stylised, clever. Standing next to it is another incredible piece, almost indistinguishable in style. It is made of three pieces of rock crystal, an exquisite ewer carved with superlative beauty, set off by a solid gold figurine handle. And it’s a bally forgery. But the museum has not moved it away from its partner whose provenance is rock solid. There it sits, a piece from the latter part of the 19th century, posing with its 459-year-old neighbour for all the world as if it, too, was seasoned by several centuries. How? How could the august British Museum possibly sanction such impudence? I’ll tell you how. Because the man thought to be the forger, in this instance, was a craftsman of such consummate skill that he would never even have been found out, had it not been for a pile of dusty papers sat in the Victoria and Albert Museum. If the Museum’s hunch is right, the forger’s name was Reinhold Vasters (1827 – 1909). And like any shady dealer, little is known about his private life. His maker’s mark is on several of the restored pieces at that treasure box, Aachen Cathedral. And it is here that art dealer Frederic Spitzer, legendary antique salesman to the stars (including the Rothschilds), spotted Vaster’s work. Vaster’s wife died in 1859, leaving him with two young daughters to look after: and Spitzer offered him work, and with that work, financial security. We have no way of knowing how, or even if, Vaster questioned the use to which his finished pieces were being put. Because he was a genius. He could pastiche the style of the 1500s as though he were Benvenuto Cellini reincarnate. What he made passed for centuries old because even the hawk-eyed experts of the day couldn’t see the joins. And his works were masterpieces in their own right: they radiated grace and intricacy. Vasters died a wealthy, though obscure, man in 1909. And his papers found their way to the Victoria and Albert Museum, where no-one looked at them much until one day, 71 years later. V&A curator Charles Truman got them out, to look at how Vasters was inspired by the greats. What precisely were the drawings of ancient things for? And he soon realised: they were not drawings of things made centuries ago, but instructions on how to make the beautiful objects which sat in the museums and houses of the great, labelled 16th century. Vasters had made them. An artist of incredible stature, he chose – for whatever reason – to live a lie. And that is why a forgery sits next to a rare and beautiful piece from the mid 16th century in the British Museum. It is so very beautiful, so masterly, that we would not realise it was a fake, had it not been for a dusty pile of papers in a London museum archive. Posted in Places to visit, Quirks of HistoryTagged antiques, art, British Museum, ewer, forgery, history, Reinhold VasterBookmark the permalink. Of course, it is now over a century old and would be considered an antique if someone ran across it today :-). Ah, but we’re all temporal snobs here, Steven, me most of all. If a thing is 400 years old that matters to me. It is almost tangible, the time which has slipped between the fingers which have held it. Thus the building I work in is beautiful, but it is only 150 years old. I would rather work somewhere like the Banqueting Hall, which ahs centuries under its belt. It is said that Vermeer painted some 200 masterpieces, 1000 of which are in the United States of America. 😀 That I can believe, Roger. What is beautiful is beautiful, whether made today or five centuries ago. That discovery must have set the august portals of the Museum a-humming. The lad was prolific, and his mentor had connections! We are being sucked into the vortex here, Gabrielle: todays forgers, tomorrows masters….I am inclined to agree with you that it’s still not right -not because of moral indignation but because it removes an important set of boundaries. Maybe it’s just because I’m British, but to me, time and its passing is a tangible part of a thing’s value. It is a big deal. Thank you, Elizabeth, for taking the time to read today and comment. You confirm beautifully in your comment that the temporal aspect of an object – though it may be invisible – is a huge part of its value. Seventeen something buildings are things of beauty: their scale, a visual memory of a time when things were different. You put it so well. I think its great how the British Museum is displaying it next to an authentic piece – will have to search it out next time I’m there! Hi V! Thanks so much for taking the time to read and comment. Go take a look. The very positioning asks questions…. Interesting question…beauty is beauty, no matter the artist, although to copy another’s art, albeit masterfully, is still dishonest. There it is in a nutshell, Lou. The duplicity means the very quality of the object I have been looking at is fundamentally changed, though it looks the same: for it came from a different time, and time is underrated because it hangs invisibly on beautiful things. now there is openness, it has a right to be there, beautiful and not as old. Yes: the drawings made it possible for the true artist to stand up. And his skills were extraordinary. people do strange things to feed their kids! I’m sure he never thought his work would end up in the museum though! If the intention is to trick people, I think that is wrong. But I am glad to be able to enjoy this exquisite piece. I think the idea of a retrospective of his work is a god one, Andra: his work is truly breathtaking up close. I know you would love it. I love these sorts of posts. What is art? Does it matter the origin if it inspires or communicates? Why? I see other messages layered in this, as usual, and I’m always fascinated by who may suss them out, or not. I must say I was thinking about you this morning and how much I enjoy some of the more existential and “dark”, for lack of a much better term, pieces you’ve done recently. I also can’t help noticing what appears to be a certain level of recoil, after the fact. On one of my favorites you didn’t even reply to comments, which is rare. I imagine those are not the most popular compared to the warm and fuzzies, which makes them that much more relevant. I would encourage you to consider whether the world really needs more people writing to cater to what gets them the most attention. Those that ask and seek beyond their ego or those that create for the sheer joy and enlightenment of it are what makes this whole experience richer for all. What a wonderful comment, Brett. And yours are always appreciated. Thank you. I was trained a journalist, though I can’t seem to summon enough brevity to remain perfectly true to that style of writing. And a journalist starts from where his readership is, and leads them somewhere. If I’m on a roll, I listen to the day, and the day tells me what to write. Sometimes it’s whimsical, sometimes it’s heavy, but it’s what the day says. For everything there is a season, isn’t there? A time to be idiotic, a time to shock, a time to question, a time for mind candy. I write what the day says, with a regard for the reader who needs a hold to begin scaling the cliff. Because what would be the point of starting out alone? But I shall bear in mind your words, because it is in all of us to shy away from that which makes them hated. Thanks once again. Another interesting subject to ponder, fakes… I just watched an old Audrey Hepburn and Peter O’Toole movie called “How to Steal a Million” about a fake. It’s hard not to like the forger and agree with him that his work should be in museums. And it’s a funny, enjoyable movie. Sounds a great film, and I love Audrey 🙂 Thanks for the recommendation! Dear Kate, this posting has me thinking and realizing that I don’t have an immediate response to your question at the end. I’m deeply philosophical and my brain is not a “first-rate” one and so questions like yours require a lot of musing on my part. I also read the comment by Brett, which he labels a monologue. His take on your postings gave me a lot to think about also. And finally, I thought you were going to take a break. Did you reconsider that? Peace. Instant answers uneccessary, Dee 🙂 I,too, take a lot of time to internalise ideas. The break is hovering out there waiting. I said to myself that the day an idea did not present itself, I would not go out and look for one, but let the blog lie fallow. So far the ideas have been tumbling out. The act of scurrying around like a mudlark, collecting bits and bobs and patching them together, gives me great pleasure. Perhaps I am addicted. You posit a very interesting question, Kate, for the Vaster’s piece looks rather exquisite on its own. I think it belongs in another area of display or, if continued to be included with Tudor-era treasures, it should be identified as what it was — a fake. Possibly there could be a section displaying other Vaster’s fakes? He clearly was a massively talented artisan in his own right. Wonderful idea, Lame: a Vaster retrospective. I would be first in line. His story is as seductive as the gorgeous work he produced. Forgeries, fakes, intention to deceive: as you say, it can all be very grey at times. One way to look at it is in terms of winners and losers. Who stands to gain, who gets hurt, and do the ends justify the means? Museums are full of beautiful things. I recently looked at the reliquaries in the British Museum and the V&A in connection with a book I was reviewing (http://wp.me/s2oNj1-gemstone, since you ask), and it struck me that the vast majority of these objets d’art were made to enclose fakes: this virgin saint’s bones, another holy man’s tooth, Doubting Thomas’ finger, Jesus’ afterbirth. Not all were in these two museums of course, but on any measure of scientific provenance most of these had been reverently and intricately constructed to house a lie. And yet, if these objects had not been faked, would we be looking at empty display cases, denied what credulous rich rulers and institutions had commissioned, literally, in good faith? We can have an ambiguous attitude to loveable rogues (by all accounts many art forgers are just such as these); does the fact that they can create beautiful works of art mitigate their sin? Sorry, more questions than answers, and I’m rabbiting on a bit, as per usual. Rabbit away Chris, you never fail to teach me something new! Yes, duplicity has been with us and art created to accommodate it. But I use these objects to draw conclusions about a society: each object is part of a key whcih unlocks the attitudes, the ethos of a people. And if it’s a forgery, it is as if my conclusions are based on dodgy research. I think I’m looking at a primary historical source and instead this is at best secondary. You’re right, of course, to draw distinctions between primary and secondary sources. But I always think secondary sources are interesting in themselves, and can be further interrogated as responses to the primary and as indicative of the ethos of a later generation. And that’s the great thing about the scientific method: you have a hypothesis as a possible answer for a question, which becomes a theory when that answer becomes generally accepted. Then new facts emerge as a result of further research and the cycle begins again. There’s no absolute truth available to us as our fallible senses are unreliable interfaces. And that’s my submission for Private Eye‘s ‘Pseuds Corner’. I answer your question with a question: did he make them with the intent to deceive or was he an artist making as beautiful a piece as he could for a patron? The historical sources are sketchy on this character at best, Hope. But the evidence points to him knowing what was happening when his work passed to Spitzer. Perhaps his intent was more passive than the salesman’s; that would be unsurprising. I don’t understand the side-by-side display. A forgery is a lie and somehow this story makes me feel sad. Sad for the artist, not knowing what compelled him to complete the lie, and sad for those who were duped! I can’t imagine destroying something still beautiful and by now having some age and history of its own, but it doesn’t need to be given such a prominent space, perhaps? How odd that the museum allows the impudent toddler to sit about among its centuries old elders instead of relegating it to the nursery. Is the piece’s actual date advertised where it sits? His story reminds me a bit of John Myatt, whose story was told in the book, “Provenance”. Myatt was a single father struggling as an artist until someone took him up on his ‘innocent’ offer to recreate masterpieces. I oft think it is the artist (forger) who seems to be harmed the most by faking it- they never explore their own ‘voice’. Very interesting. But I guess the idea was not to dupe people and it is also looking wonderful. I think it does make it okay as long as we call it what it is; very old, very beautiful craftsmanship, and meant to fool. Great post. I find it so hard to keep up with blogging and working full time, and though I don’t manage to visit here very often its always a pleasure when I do. I enjoyed learning about the suspected forger – Reinhold Vasters. I like that the B.M displayed the two pieces side by side so you can see how hard it is to spot fakes. It’s a very interesting question, Kate. There is no skill in plagiarising another’s words but there most certainly is in handcrafting a copy of another’s artwork.